If you are a geek and really like numbers, this page is for you. It is mostly a collection of statistics by Tropical John Medinger, but there are also others who have and will contribute to this page. If you have other suggestions for content or have something geeky that others might be interested in, let us know. Here are the all-time top 100 times for men and women from 1986 onward. Median finish times 1986 and onward. 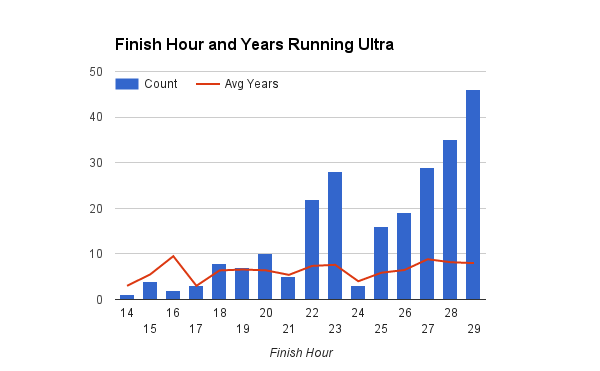 It should be noted that both 1995 and 1998 the finish time cutoff was extended to 32 hours. While those years were arguably very difficult they do skew the median times. Here is an interesting way to help you determine what splits you might want to target. This idea came from The Great Ed Willson of Eugene, OR and coded by Julie Schulte. The splits for each segment are separated into finish hour groups. Let’s say you want to run 22-23 hours. You can look at the splits that the 22-23 hour finishers ran. Outliers to the positive ran slower for that segment that other 22-23 hour finishers, while outliers to the negative ran faster than the group. The perfect split for your time goal may be right in the middle of your diamond group. Beginning in 2014, there has been an independent survey conducted by ultralive.net as runners go through check-in the day before the race in Squaw Valley. Participation is completely voluntary. Mathematical analysis of lottery by Ryan Witko. The Statistical Guide to a Silver Buckle by Ryan Witko.